Yesterday I had the pleasure of attending the UK launch of Henriot Cuvee Hemera 2005 hosted by the chief winemaker, Laurent Fresnet. Laurent Fresnet arrived for the harvest in 2005 and now encapsulates the Henriot house style in every Champagne. He has won the International Wine Challenge ‘Sparkling Winemaker of the Year’ award for two successive years; 2015 and 2016. The House of Henriot was founded in 1808 by Apolline Godinot, widow of Nicolas Henriot. It has remained a family run estate for more than two centuries and currently headed by the eighth generation. 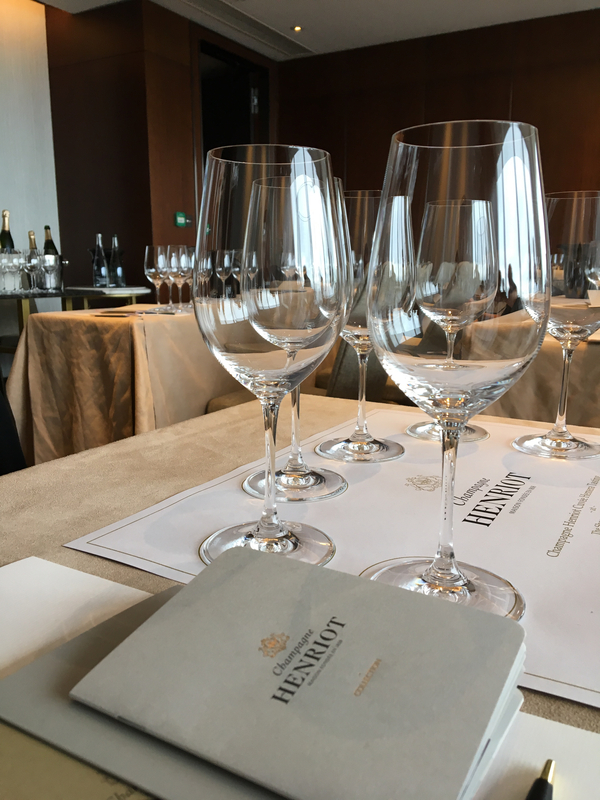 Each Champagne blend stands apart by the virtue of the exceptionally high proportion of Grand Crus and Premier Cru wines, which add an aromatic richness, freshness and ageing potential. The cornerstone of the range is the Cuvee 38, this 100% Chardonnay reserve wine allows the wines time to express and develop. The tasting started with the Brut Rose NV, 40% Chardonnay, 50% Pinot Noir, 10% Pinot Meunier and aged for three years. Very light in colour, fresh mineral characters from the Chardonnay with aromas of strawberries, red berries and raspberries. Laurent commented that for him it is more about the floral nose than the colour of the wine, hence he blends in a dark glass! Next followed the Brut Souverain and the Brut Blanc de Blancs. The Souverain 50% Chardonnay, 45% Pinot Noir and 5% Pinot Meunier and the Blanc de Blancs, 100% Chardonnay. Both very light with fresh citrus fruits on the nose. Again, the Chardonnay gives both their minerality. You could easily drink both all afternoon long. After a short pause, we moved onto the most prestigious Cuvees of the Estate. Brut Millesime 2008, composed of 50% Chardonnay and 50% Pinot Noir, only from Premier and Grand Crus. This is aged on lees for a minimum of eight years. The perfect balance of Pinot Noir and Chardonnay gives amazing mineral characteristics with a burst of white flowers and citrus fruits. This wine carries the anniversary label to mark 200 years of the Estate. Laurent played on the number eight being a significant to Henriot. Founding date 1808, eighth generation, 2008 being an exceptional vintage. He even eluded to say the 2018 will also be an amazing vintage! Finally, Cuvee des Enchanteleurs 2000 and Cuvee Hemera 2005. Technically the same wine, just a new name and couldn’t be more different. Enchanteleurs shows all the characteristics of an aged Champagne with heavy toasty biscuit notes. Hemera, delicate floral and fresh fruit notes. On the palate, honey and citrus fruits melt together to produce a stunning wine. Even after 12 years of ageing this wine is still young and fresh. This was the first prestige cuvee crafted by Laurent Fresnet. To finish, we had a few canapes served with Cuvee 38 from Jeroboam, this was a fantastic introduction of the Henriot Estate and a great opportunity to see how each Cuvee evolves. To enjoy these wines please click here.